It was Valentine’s Day. She held his limp body across her knees, as though she could rock a full grown man. His head rolled back against her shoulder, his throat bared to heaven’s jaw. She reached for his torn, red smeared hand. Did she remember the valentines he had made for her…the way his tiny hand gripped her finger, and the dear sounds he made when he nuzzled her breast? Did she remember the valentine gifts…the pretty rocks he brought her, the bird feather, the ripe olive, shiny and black? It was Valentine’s Day. And there on the hill called Skull she held her Valentine and sang him a love song, a lullaby. It had no words, but was a mixture of the sound of angels’ wings, the smell of frankincense, and the taste of dust and blood. She looked at his eyes, the muscles of his chest, the strong sweep of his thighs, and thought of how divinity had swelled within her, of how she grew big and awkward as she puffed up the hills of Nazareth. My, it seemed only yesterday. She thought of him moving within her and of his birthing out of the dark pain. And she remembered how she felt that she could not bear his sweetness. It was Valentine’s Day. She sat there with God on her lap, holiness in a heap. From all appearances the love affair between God and creation had gone terribly awry. The Valentine sent to us had been trampled, torn, spit upon, and rejected. She held her Valentine and her heart broke, and he, broken for her, for us, allowed himself to be held. And holding him she held all the others spilling from him, the whole aching lonely hearts club. And in that moment she became a Valentine herself sent from Love to be Love. Those who follow God’s ragged Valentine, Jesus, get their hearts broken over and over. For Christ dwells in them, swells in love, and bursts their hearts with compassion. Such are the lovesick fools who hold creation’s broken ones. 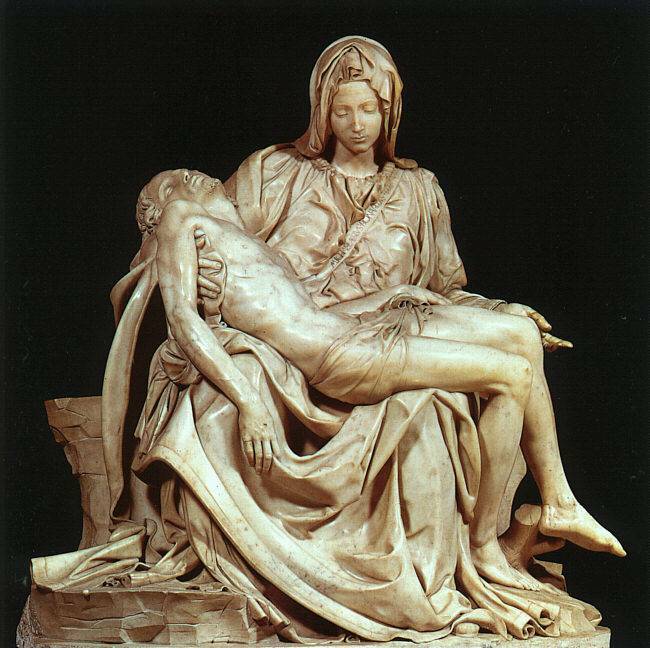 Such are the lovers who mother God’s children and in their mothering discover their own brokenness is mended. It was Valentine’s Day. Some will come to call it Good Friday. It might even be fitting to call it Mother’s Day. But calling it Valentine’s Day helps me remember what love is all about. This piece is from a collection of monologues and reader’s dramas I wrote a number of years ago titled Blessed Are the Poor. 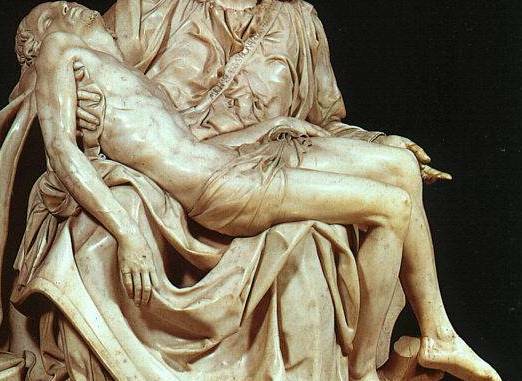 This entry was posted in Good Friday, Lent, Valentine's Day and tagged crucifixion, John 19: 25-27, Pieta, suffering love. Bookmark the permalink.